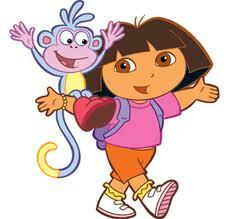 The boys started their love of Dora the Explorer around the age of 2. Now they are 6. With the exception of a few days here and there, I've seen Dora every single day for 4 years. I've seen every episode she's ever recorded. Sung every song. Read nearly all her books. I think she's got a lot of great knowledge to share with us. Always carry your backpack. ~ Everywhere you go, there will be a clear path to follow. ~ Almost all inanimate objects can speak, and they usually speak Spanish. ~ Almost all animals can speak as well, and they are often bilingual. ~ All baby animals like to be sung to sleep. ~ It's good to have a reliable set of friends. ~ Those friends will pop up conveniently whenever you need them, and will have, or be driving, precisely what you need. ~ Your family is very jolly, lighthearted and supportive, and always willing to go on adventures with you. ~ When bad things happen, they will happen in very slow motion, so you have plenty of time to consult your friends or your backpack. ~ When you travel to different countries, the first thing you must do is dress appropriately and then learn to sing "hello" in whatever language they speak there. ~ Magicians and witches are evil, but very easily outfoxed by a 6-year-old girl and her monkey friend. ~ Please really is a magic word, if spoken in Spanish. ~ Always be nice to your enemies, even though time and again, they show up to try to swipe your stuff. ~ The correct pronunciation of Tapir is "tape-ee-er." ~ Aliens are cute, colorful little furry creatures who behave and speak like toddlers and have American names. ~ When things work out in your favor (and in the end, they always do), you should always do a little celebration dance. ~ Be kind to animals. ~ You're nobody if you can't count to at least 10 in English and Spanish.